Jodewood is the southernmost region of the greater Reaper's March. 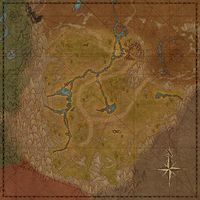 The region of Jodewood is a border region between the provinces of Valenwood and Elsweyr, mainly the former. It was in this area, the Crescent River ends from the northern end of the March. The capital of the area is the city of Rawl'kha, a trading post in between the two provinces. The town of Willowgrove is a minor settlement known for being a brewery like the towns towards Valenwood. The Do'Krin Monastery is an ancient Khajiiti temple dating back to the time of Darloc Brae. The ruins of Thormar are known to be where worshippers of Baan Dar have gathered to enter the Five Finger Dance.